Definition at line 26 of file pkcs8.h. Definition at line 29 of file pkcs8.h. References Botan::PKCS8::BER_encode(), Botan::PKCS8::BER_encode_encrypted_pbkdf_iter(), Botan::PKCS8::BER_encode_encrypted_pbkdf_msec(), BOTAN_PUBLIC_API, Botan::PKCS8::copy_key(), Botan::PKCS8::load_key(), Botan::PKCS8::PEM_encode(), Botan::PKCS8::PEM_encode_encrypted_pbkdf_iter(), and Botan::PKCS8::PEM_encode_encrypted_pbkdf_msec(). Return an error code associated with this exception, or otherwise 0. The domain of this error varies depending on the source, for example on POSIX systems it might be errno, while on a Windows system it might be the result of GetLastError or WSAGetLastError. For error_type() is OpenSSLError, it will (if nonzero) be an OpenSSL error code from ERR_get_error. 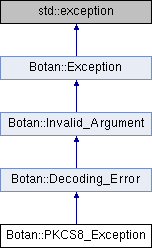 Reimplemented in Botan::System_Error, Botan::Compression_Error, Botan::OpenSSL_Error, Botan::CommonCrypto_Error, Botan::TLS::TLS_Exception, and Botan_FFI::FFI_Error. Definition at line 105 of file exceptn.h. Return the "type" of error which occurred. Definition at line 191 of file exceptn.h. Return a descriptive string which is hopefully comprehensible to a developer. It will likely not be useful for an end user. The string has no particular format, and the content of exception messages may change from release to release. Thus the main use of this function is for logging or debugging. Definition at line 89 of file exceptn.h. Referenced by Botan::RSA_PrivateKey::create_decryption_op(), Botan::RSA_PublicKey::create_encryption_op(), and Botan_FFI::ffi_guard_thunk().